September 12, 2007. My husband and I were at a biker's event drinking beer, laughing, drooling over the gorgeous motorcycles and laughing with friends when the call came. It was a call that would change one life for eternity and the lives of the others that were left behind forever. My daughter called. Through the music, the laughter and the roaring pipes of the Harleys, I couldn't hear her well, but I could tell she was hysterical. I walked far out into the field and put an ear plug into my free ear. Her 18 month old son, Josiah, had fallen down the stairs at my house. They were at the hospital and the news was grim. He had a severely lacerated tongue and scans showed a broken leg, a fractured skull and bleeding in his brain. Josiah was immediately transferred by ambulance, lights flashing and sirens screaming, to the children's trauma hospital in Portland. I couldn't think. There was nothing I could do but wait and call my dad. I rarely write of my faith on this blog because it's personal to me and I don't want to offend anyone with differing beliefs. Tonight's an exception to my rule. I made the call to the only parent I had left since my mother had been killed the year before. In one phone call I had been transported from a mother and grandmother into a child needing my daddy. My dad had no faith in anything he couldn't see, that he couldn't touch. We were raised in an atheistic environment, but I always had this feeling, this faith deep inside my soul. When Dad answered the phone I began crying as I told him of the events that led to Josiah's hospitalization and what the scans showed. My dad had always been my rock. He hadn't been a good father while my brothers and I were growing up, but since my mother had been tragically taken from him he changed, our relationship changed. He had softened, he grew to know how to give and how to receive love. He told me not to worry, that Josiah would be fine. He calmed me as I waited for the next call from my daughter. When I got off the phone with him he called Karli. The words he spoke were not the words of a man that refused to believe in faith, in something bigger than himself, they were the words of a believer. He told her to do what she had told him to do every day since her grandmother was killed 13 months earlier. He told her to pray. He told her that God would not allow a second child of her's to die. The three of us, Karli, Dad and I exchanged many phone calls that night. In each call Dad assured us that Josiah would be fine, that God would hear our pleas. He firmly told us not to worry, but to know the baby would be fine. A very good friend of mine is a pediatric neurologist. I called her and she jumped into action. She was at the hospital in a flash and was on top of his case. She told me the scans were bad and they didn't know what the outcome would be. His injuries were severe and the bleeding on the brain was at the top of the list. Soon Josiah began to vomit and he was rushed for emergency scans. When my friend came back into the room with the scans she had the first scans as well and was followed by nearly a dozen awe struck doctors. She put the first scans up for everyone to see. The scans were horrible. 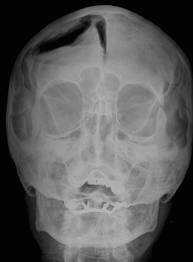 The fracture was clear, as was the blood pooling within his tiny skull. His leg was broken badly. Not a word was spoken as she put up the second scans, there were only gasps. The second scans showed no fracture, no bleeding and no broken bones. The only thing they could find wrong with the tiny child was his lacerated tongue. She called me as soon as she showed the scans to Karli and her husband. Her words were "I've shown a team of doctors the first and the second scans and we have no explanation for what isn't shown in the second set of scans. Teri, the scans are perfect, Josiah is fine. I have no explanation." The first thing that next morning I called my father and told him the news. He simply said, "I know." He said it with the conviction of someone that had a hand in the process, he said it clearly and knowingly. That was the second to the last time I ever spoke with my father. You see, that night, September 13th, 2007, my father died. When my brother entered my dad's house to check on him that morning he saw Dad's oxygen machine. Dad never went to bed without it. He found his cell phone, something else Dad never went to bed without. He found bowls of water scattered about the house for the dog, bowls that had never been there before. My brother made his way into the bedroom and found my father dead. He was in a kneeling position beside his bed. It's my firm belief that my father made a promise that night. My brothers, Karli and I firmly believe, based on our last conversations with him, that my dad made a trade. That he made a deal with God. A deal that if God would spare Josiah's life he would accept Him and would trade his own life for the life of the child. When I next saw my Dad he was cold and lying in his casket. I kissed him, I hugged him and I thanked him for the trade he had made. I didn't lose my father that night. I gained an eternity with him. I have chills head to toe at this very moment. You and your family have been through SO very much. I love you, and love that you have proven to become a stronger woman from each of your experiences. OH! This post made me all sniffly. Beautifully written, hon. Teri, what a touching story. It choked me up and I'm not much on faith. This story seriously moved me Diva. I'm so sorry to hear about your father and about everything you've had to suffer through. Sometimes life just isn't fair. This gave me tears, I'm agnostic (something I don't talk about often unless someone asks because it's personal) but stories like this always give me a little pause. Girl, reading this gave me chills! Such a touching and powerful story! Hugs to you. Wow, Teri. I can't believe this happened in your life. As a believer, I believe in redemption. How lucky and blessed you are to have witnessed it firsthand. Oh wow, such a deep, touching, and amazing story! All of it is mind boggling, and I'm glad he found comfort and peace with God before he passed. What an incredible miracle with Josiah! I have chills and tears and I'm so completely blown away by this story. I'm speechless. I would never question it. I have seen too many things that cannot be explained through science or logic. I'm glad you shared the story. I also understand how faith is so personal. Only you can understand the true meaning of it to you. I am sobbing as I read and reread this. I wish I could have a faith so strong and enduring...God bless your papa. I believe in eternal Life.... & I believe I will be with Kay again in Paradise. Btw, Never be afraid to offend about your faith. People love you!! Wow. I don't know enough of your history to know if this is a writing excerpt (absolutely heart stopping) or if it is true (absolutely heart stopping, absolutely beautiful and heartbreaking at the same time). You just made me feel like my life isn't perhaps as useless as it feels right now. Thank you for that, and for your comment on my blog. I was sneaking a look at your blog today and broke out crying which does not look good when you are at the front desk welcoming patients for a doctor. Later, I reread your post and had a good cry again. I lost my father, my guidepost, on October 13, 2010. I can hear him speaking exactly as your father spoke and acting as your father acted. Thankfully your dad can be remembered each year in the sacrifice he made and the life he saved. My thoughts and love are with you in this time of remembrance. Did your dad "trade his own life for the life of the child"? I find that thought really frightening. I'm quite emotional after reading this. What a moving story of a miracle granted by our Savior. I think it was a courageous thing my father did for the love of his great grandson. My dad had lived his life fully and his one desire was to lie next to my mother. And giving one's life so others may live is a crucial part of Christianity. No, I have a very difficult time writing fiction. If you read a little more of my blog you'll see that my life and the life of my family is far from ordinary. Truth, in our case, is stranger than fiction. Thank you everyone for your encouragement. It was a terrible and a joyous time all mixed together. At least it gave me a bit of peace over my father's death. Josiah now has an incredible testimony of a true miracle in his life and I will have my dad again, something I had been in doubt of for years. Yes, Karli, your grandfather loved you very much. AACCKK woman what is it with you and making me cry?? When my memaw was in the hospital after her last heart attack she was literally across the hall from a woman who had given birth to a very premature baby. Memaw's condition would go up and down much like this baby's. There came a night that Memaw was dancing on a precarious edge, as we later found out so was the baby. In the midst of my family's tears and fear my memaw told them that she had lived her life, and that her death would only result in life for someone much younger who needed a chance at life. We could not figure out what she was talking about. Within the hour as my mom told it my memaw had passed with this huge smile on her face. As they were sobbing from the loss of our matriarch, across the hall there were whoops of joy and elation. My mom and aunt stepped into the hall to find out what was going on only to learn that the premature baby had literally been given last rites due to the severity of it's issues. Suddenly the baby did a complete 180 and its stats and such began to climb upwards. We believe memaw did the same. We never did know how she knew about that baby's health, or even about that baby unless she heard the nurses talking. But we do believe she chose to go and leave that baby here with his family to live a full life. AWESOME story. Beautiful - and tragic - all wrapped into one. I am really glad you shared... and I also believe in the power of prayer, just as your father obviously did. Just as everyone in your family and in that hospital probably does today. Im lying in bed reading this and crying. You can't know how much this post means to me. I'm lying in bed reading this and crying. You can't know how much this post means to me. Oh my. I have no words, well almost no words...God Bless your father, what a wonderful man. I am an absolute believer In those kinds of things, and I know I will think of him often, that is not something one can forget... Lots of love, truly.